Zelkova sicula is a relict species from the Tertiary period. Endemic to Sicily, it is considered one of the rarest and most endangered woody species in the world. It is a small shrub or tree with greyish bark and oval, hairy, serrated leaves. It was first discovered in 1991 in the Iblei Mountains in eastern Sicily and was thought to exist only as a single population of 230 shrubs in a very restricted area. A second population was discovered in the same mountain range in 2009 but again only contained about a thousand trees in a very small area. The two known populations show remarkable differences in shape of the leaves. The individuals from the first discovery are morphologically very close to Z. abelicea – a related species from Crete. 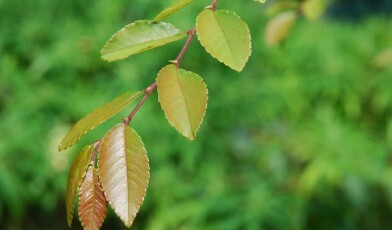 The leaves of individuals from the second populations are on average longer and show more similarities with Z. carpinifolia – another related species from the Caucasus region. Unlike the other members of the genus which are diploid, this species is triploid and exhibits pollen anomalies. This may explain why all seeds produced appear to be sterile and propagation is from root suckers. Studies have indicated that the remaining populations of Zelkova sicula may go back to just one individual. This lack of genetic variation of the species reduces its ability to face environmental and/or biological changes of its environment. Bovine grazing exerts a significant pressure on this species, and extreme climatic fluctuations and droughts in recent years have accelerated the process of degradation. Currently there is no legal protection for this species. However, the areas where this species is found are fenced to prevent grazing. However, the exclusion of land from human activity requires additional public awareness to improve acceptance by local farmers. It seems very probable that other yet undiscovered sites with Z. sicula still exist on Sicily, therefore additional field surveys should be undertaken. Studies of this species reproduction biology are also required in order to inform a reintroduction program. GTC have developed an action plan for the conservation of Zelkova species and are undertaking practical conservation work to protect them. Read more about this project.